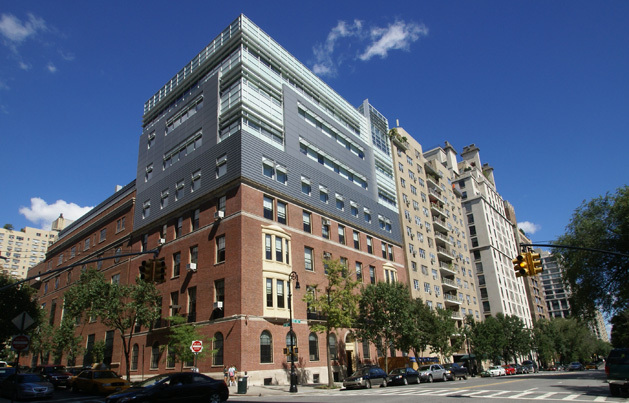 The Upper East Side boasts numerous "exclusive" preparatory schools for girls but the two most prestigious and famous have always been Chapin and the Brearley School, which are both a block away from each other. Chapin is on the northwest corner of 84th Street at 100 East End Avenue. Brearley is at the eastern end of 83rd Street at the FDR Drive where it occupies parts of two buildings across 83rd Street. Chapin has lovely views of Carl Schurz Park. Brearley has spectacular views of the East River. Chapin, until 2007, had a very handsome Georgian-style, low-rise building. Brearley had a dark brown-brick mid-rise building. In 2008, Chapin completed an expansion that added several floors to its existing structure. The expansion was designed by Marner Architecture in a modern style that is completely out of context with the existing building and surrounding buildings even though it is not unattractive if it were its own free-standing structure. 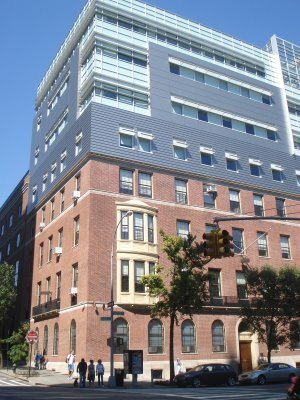 The expansion did not win the famous school a lot of brownie points with its adjacent neigbhor, the apartment building at 110 East End Avenue. The Chapin School was founded by Maria Bowen Chapin and opened in 1901 at 12 West 47th Street as Miss Chapin's School for Girls and Kindergarten for Boys and Girls and it then had an enrollment of 78 students and seven teachers. Four years later, it moved to 58th Street and in 1910 it relocated to 57th Street. It finally moved to its present location in 1928. The last year that boys attended the school was 1917. The school's motto is "Fortiter et Recte," (Bravely and Rightly), and the school's emblem is the wheel that was meant to kill Saint Catherine of Alexandria, but which miraculously fell apart, symbolizing the students' "spirit of endurance and moral fortitude" and, according to the school's website, "The students leave assembly, which is called prayers, in a wheel pattern." The addition consists of two-and-a-half floors that will contain new language, science, a green house, and art facilities to account for the growth in student body. The construction was finished for the 2008-2009 school year and the school now has eight and a half floors. The school is ranked very high nationally and in late 2007 it placed third in a list of schools with senior classes of at least 50 in a Wall Street Journal ranking of college placement at Harvard, Princeton, theUniversity of Chicago, John Hopkins, MIT, Williams, Pomona and Swarthmore. Its well-known alumnae include Jacqueleine Kennedy Onassis, Vera Wang, Queen Noor ofJordan, Christine Todd Whitman, Sunny von Bulow and Ivanka Trump. The school has an enrollment of more than 660 students and in addition to 49 classrooms, the school building includes a two-story library with a multimedia room and a video editing room, 6 science laboratories, 4 art studios including a photography darkroom and a ceramics studio, 2 music studios, a black box theater, a dance studio, 2 computer laboratories, 4 gymnasiums and a greenhouse. One commenter on an Internet blog posted a comment about the school's new addition that "the only thing left to do is reclad the bottom half" and another commenter asked "is it like a bad Japanese movie with people running and screaming as they look up?" "When representatives of the Chapin School, one of the city’s elite private all-girls institutions, went before the local community board this month to present expansion plans for its building on East End Avenue, the head of school, Patricia Hayot, was in the audience, along with a few students. But though the board approved the proposed expansion, Dr. Hayot found herself on the receiving end of a rap on the knuckles and an impromptu civics lesson from more than one board member. Chapin’s proposed expansion, which requires city approval, would add three stories to its existing red brick building, at 84th Street, providing new science labs and other facilities. But the construction would also seal off some windows along one wall of the apartment house at 110 East End Avenue, immediately to the north of the school. Despite the project’s impact on the apartment house, the public hearing on the expansion, held on Sept. 13 by the land use committee of Community Board 8, was sparsely attended. Gerald Solovei, one of a handful of tenants from 110 East End Avenue who spoke at the meeting, suggested a reason for the small turnout. Notice of the meeting, he said, had been posted in his building less than a week earlier. In addition, he told the board, Chapin had held a private meeting the previous day to show the plans to some, but not all, of the tenants of 110 East End. Later in the meeting, Jane Parshall, a board member, chastised Chapin and, by extension, Dr. Hayot for their behavior. 'I just wish the school, trying to teach citizenship to these young ladies sitting behind me, would practice some citizenship itself by meeting with the neighbors of the adjoining building instead of with just a few of them,' Ms. Parshall said. 'I’m shocked,' she added. 'These independent schools require community service. They want their young ladies or young men to go out and reach out to see how the other half lives all the time. But they often don’t practice it themselves.' In response, Dr. Hayot said in an interview on Thursday that the neighborhood had been invited, through the East 84th Street Block Association, to a Chapin open house in March at which the expansion plans were laid out in detail. 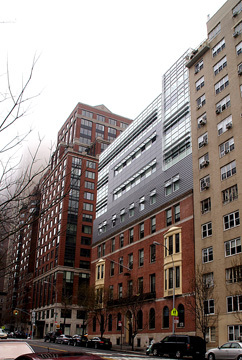 Some residents of 110 East End were on hand, added Howard Goldman, the school’s lawyer. 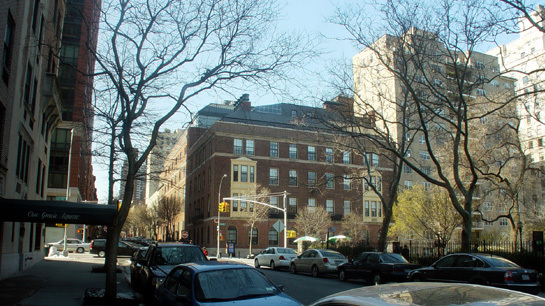 As for the private meeting the day before the land use committee met, Dr. Hayot described it as simply an informal coffee that the school’s plant supervisor shared with two neighbors: Leon Negron, a representative of the East 84th Street Block Association, and one tenant of 110 East End. 'It was five minutes of my time walking in to say hi to Mr. Negron because I hadn’t seen him all summer, Dr. Hayot said. Despite the flurry of controversy, the committee voted 19 to 16, with one abstention, to approve the Chapin addition."